Looking for a passionate city to celebrate for love? Seville is the one! Capital city of Andalusia, Seville is at the crossroad of western and eastern civilization… A hot and vibrant city, it is a place for passion. 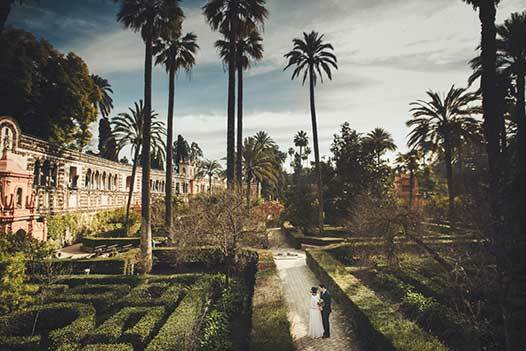 Whether you want an elopement or a vow renewal, Seville romanticism will seduce you! Seville is replete with romantic locations. The Alcazar, a royal palace built by Moorish kings, the Giralda, the bell tower of Seville cathedral from the same period of time, the Plaza de Espana or Torre del Oro are all charming romantic locations! Seville is often referred to as the most typical city of Spain : it is the birth-place of flamenco dance, tapas street food, and stunning architecture altogether. Seville will be a perfect gateway for just the 2 of you : beauty, culture, food and entertainment, all in one place, and on a budget ! There are many locations were you could choose to set your celebration, and we will be happy to help you select the best-suited place. Let you and your loved one experience an awesome symbolic ceremony in Seville at the heart of Spanish romanticism. Seville has many other secret locations that you could enjoy! It can go from a small square in town to a wonderful garden but the most favorite is the Plaza de Espana. In all cases, our Love Gracefully officiant is there to make this day the best day of your loving life! At Love Gracefully we are specialized with Spanish small intimate ceremonies. All our partners and vendors are some of the best local artists. Would you wish a hair and make up artist, a photographer, flowers, a car or a film director, we know where to go to get you the best of Seville. Well, if you are choosing to elope here, without family, they might not be so happy about it. But one way to make them feel like they are with you, is to bring back home great photos and why not a wedding video of this very special day. We have worked with amazing wedding artists, that we will be happy to introduce you to. Seville in some of the world most amazing wedding photo backdrop you could ever dream of. After having celebrated and experienced over 350 ceremonies throughout Europe, we know at Love Gracefully that Seville is a city full of wonders! You could want an engagement or proposal session, a destination wedding, an intimate vow renewal ceremony or a small elopement; in all cases we will create the ceremony that fits your personalities. You can watch many couples share how they experience their ceremonies with us on this video. Our wedding celebrant in Seville is a real professional, he is not a part-time worker or a student. He will tailor-make a ceremony that fits your needs, your values, your personalities and your beliefs. At Love Gracefully we are dedicated to make this day the happiest day of your life as well as the most romantic one. We know that planing a symbolic ceremony from a foreign country, without knowing the language, can be a difficult task; that’s why, at Love Gracefully, we will listen to you, get to know you, hear your needs so we can help you plan and get what you dream of, and even more. We can’t wait to meet you in Seville soon!